I am getting married next month and my fiancee is planning a surprise diving honeymoon. But my fear is that its going to be to the Barrier Reef of Australia as I found the tickets the other day. This is a problem as I have a total phobia about spiders which he doesn't know about yet and I know that Australia is full of them. Am I right in thinking that there are going to be some poisonous spiders out there, even on the coast which could kill me, or should I not worry at all? Well what can I say to reassure you. Not a lot! To answer your question there are venomous spiders in Australia and they do have the potential to kill you. But as you know Australia is visited by many millions of people and they have a wonderful time without so much as seeing a spider at all, let alone getting bitten by one of the toxic varieties. The one to look out for in the part you may be visiting on your not such a surprise honeymoon is the Redback spider. This is a close relative of the Black Widow that is found in the Americas. The Redback is not an aggressive spider but contact comes by accident when the unfortunate victim either sits or lays a hand on it. Redbacks are known to live under the seats of lavatories. So it is advisable to always check before you sit down as the consequences can be a trip to the local Hospital for a shot of antivenom. The really nasty spider out there doesn't live so much in the outback but more in the suburbs of the bigger towns like Sydney and along the East Coast. It's called the Funnel-Web Spider and is an aggressive spider that can bite you without provocation. It usually lives under raised houses in its funnel shaped web. They have been known to come out from under the house with the sole purpose of biting the foot of any adult or child that may be in the garden. If this happens death can come as a result and it is important to lay the victim flat, apply a pressure bandage to the affected area, but not a tourniquet, and make sure they are transported to medical back up with as little fuss as possible. Symptoms that can develop are the local reaction to the bite, with pain and inflammation right through to paralysis of the nervous system with death due to respiratory failure. So those are the two worst you could encounter, but there are plenty more that can still inflict a nasty bite, or as one Australian arachnophobe once said to me "I don't care whether they're poisonous or not Doc, just seeing them will give me a heart attack". My suggestion is that you would be in a spider free zone if you went on a live aboard around the Whitsunday Islands, and the diving would be a lot better than some of the Cairns shore-based round trips to the inner reef that are done. However perhaps the best long term option is to get some help with your problem. One therapeutic technique is called "flooding". Here the phobic is made to face their fear for as long as it takes, so you would have spiders crawl all over you until there was no more screaming. Unsurprisingly this technique has been waning in popularity. I am going cave diving in South America and my doc is not sure what shots I need. Can you help me out? This is a fairly straightforward question, however there is a little twist which you may find interesting. The baseline shots to make sure you are always up to date with, even if you are in the UK are tetanus and polio. What you then need to top up with before going out to South America are typhoid, which comes as a single shot in the arm, or there is an oral version for those who don't like the throbbing arm pain that typhoid immunisations always seems to cause. The next is Hepatitis A, a single injection giving you a years immunity, another shot after 6 months increasing your immunity to 10 years. You are also advised that South America carries a risk of Yellow Fever, a viral disease spread by forest dwelling mosquitoes, and in many countries it is mandatory that you have a certificate of immunisation against this illness before you enter the country. Yellow fever has recently been spreading into more urban parts of this continent, because human habitation has sadly moved into forested areas, and also the mosquito has been making tracks into areas where it was never found before. The debate though is whether you need to have a rabies shot. This will not prevent you from getting the disease if you are bitten, but means that if you are you will not need to find the immunoglobulin, which can be very scarce in many parts of South America. You will still need to have a course of rabies injections if you are bitten by a suspect animal but these are easier to get. So, what are the risks of getting into contact with a rabies carrying animal? Well, normally its fairly rare, but one species that does carry the rabies virus is the bat. The virus can also be present in the excreta of the bat, which is found on the floor of the large caves where they roost during the day. It has been stated that there is a theoretical risk of contracting rabies if this excreta is inhaled. So if you are caving there is a fair chance that this may happen to you, so I would also recommend that you have a rabies shot too. The best way to prevent inhaling rabies laden bat excreta is to wear one of those masks that cyclists wear in polluted cities. Likewise I would always ask any local guides what the current information is on the bat colonies that live in the caves you are about to go deep into as they will be far better informed than most other sources. Finally, don't forget your malaria medication and also a good secure mosquito net. If you are caving in remote areas you are entering Vampire bat and also Cone-nosed bug territory. We all know about the former, and the latter is the vector that spreads Chagas' disease. So remember a mossie net is not just for keeping off mosquitoes, but all the other biting bugs bats and animals that would cause most travellers sleepless nights as they lie in fear of what will drop onto their heads at night from the ceiling of their hotel room. I have recently returned from a diving trip to Zanzibar, where due to the fact that all my money was stolen I had to spend a few nights in a dirt cheap hotel until more was wired out to me. Since my return I have had the most awful itching on my hands and feet, but what's odd is that it is mostly at night. Any thoughts on what it could be? I think I can make a diagnosis here with some assurance. You have unfortunately contracted one of those skin infestations that seems to be becoming commoner as more people travel over the world. It sounds like something called Scabies. This is caused by a tiny mite, Sarcoptes scabeii, which is caught by either being in contact with a person or rarely bed sheets where the mite has previously been. The mite having got onto your skin normally finds its way to specific areas of your body, notably the wrists and finger webs, also the feet and ankles and finally your genital area. Having got there, the mite burrows under your skin leaving a tell tale track to its hiding place. The reason the itching occurs is that the next part of its life cycle is that when it is night, it comes out of its burrow and lays its eggs on the surface of your skin. This usually occurs at night as those areas where it lives on your body are now warm and moist which make for a better environment for the eggs. However the eggs on your skin do cause an intense itching and part of the process is that you reimplant them by scratching your skin and also it helps to spread them over other parts of your body. The usual signs of this disease are the previously mentioned tracks, and also a rash where you have been scratching your body. I have seen very bad cases of this in the past where the infestation has affected the whole body, and this is what used to happen years ago before any cure was around. In very rare cases it can even lead to death where infection gets into the blood stream from the open scratched sores on the skin. We are luckier now, though as it is very easy to treat. The basis of the cure is an antiparasitic cream called permethrin which you have to apply to your whole body from neck down to the tip of your toes. Leave the cream on for 24 hours then wash it off and reapply again. One day later wash it off and that should finally get rid of it. As the mite can still live on clothing and sheets for a while then you need to wash anything you have worn or slept on since your return on the hottest wash available to kill off any remaining mites or their eggs. Finally, this rash and itch usually comes on about 6 weeks after contact, if any diver experiences an itchy rash sooner after diving, then it is wise to make sure it is not a case of "skin bends". This though is more often found on the shoulders and trunk and associated with an odd marbled looking rash. 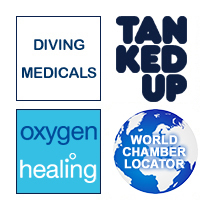 The only effective treatment for this is recompression in a dive chamber, and if you don't know where the closest one is to you, then contact e-med and we can direct you to one. I have just returned from Mexico (Cozumel) and I have a very strange rash on my leg. While diving on the second to last day I had a sting on my leg while lying on the bottom taking a picture. The sting was not too bad and not the first either, so I ignored it. The stinging abated after a few hours and I assumed I had rubbed against some fire coral, albeit that I did not see any near where I had settled. It is now four days later and unlike the other stings has developed into a long rash about six inches long which is very red and lumpy. It looks a bit like 30 mosquitoes all homed in on the same place. Lastly the rash does not itch or sting and merely looks unsightly. Is this anything to be concerned about and should I do anything about this? And there I was too in Mexico. Smoothly moving over a bare rock to approach the seal pups.when ouch, what the f*** was that. I had gotten stung by something invisible. I went back to look and there were a couple of weird looking fronds. Like tiny sea bracken, it must have been that. All was OK for a few hours then it kicked in and itched like hell for the next two weeks. So I was introduced to the evil hydroid. That's what's got you too. God or Darwin put them on this planet to create good copy for diving medical columns as they don't seem to do much else. Use a mixed antibiotic/steroid cream and don't scratch. I suggest Fucibet applied twice daily, and next time stay mid-water. I have just returned from Sharm and I have been attacked yet again by unseen beasts of the deep! I luckily wore a full wetsuit but got stung on my wrists ankles and face and lips (it was sore when it got me and my fellow divers felt the stings but didn't have the bad reaction.) The next day I had itchy bumps and now they have turned into fluid filled blisters. This has happened to me before (hence the full wetsuit in 28 degree water) in the Maldives and Thailand but not in the Caribbean. I did not see jellyfish nor did I touch any coral. I thought in the past it could have been small jellyfish but the dive outfit I was with says it is plankton. Any idea of what this mysterious beast is and how I can avoid it in the future and get rid of this horrendous rash!! Any help would be appreciated!!! Yup, it’s the plankton, zoophytes or zoon sort of beasties. Not much use to man or toothed mammal, but I guess they make up some part of a food chain somewhere. If you are covered in an itchy rash, then the best thing to take is some oral antihistamines, like Clarityn, with calamine lotion. If that doesn’t work, use a mild steroid cream over the area, say a 1% hydrocortisone. It may take a while though. I got hit by these critters and it was a good 2 weeks before I stopped rubbing my back against trees and other tube passengers. Prevention is always the best way, but you have to be practical. A neoprene gimp suit would raise too many concerns on a Carib boat. Mind you so would pulling out a pot of Vaseline and handing it over to the Instructor, with the order to “sort me out so the pricks don’t hurt.” Best you go with a stinger suit, lycra gloves and one of those new face masks as advertised in the back of this mag. It feels like very tiny stings, but I don't react till the next day. Even though I try my best not to itch, the stings become painful, red, swell up and blister! Someone suggested using a gel called Diprobase? Would this help to protect exposed skin against whatever it is that I seem to react badly to? No Diprobase is the wrong stuff. That's what you put on a little babies bottoms when it gets all sore and rashy. The stuff to use if you need to barrier against stings is something thicker that will stay on you in the water. Rather like some buddies we know! Try Vaseline or other forms of petroleum jelly. Of course, do not dive without a wet suit or stinger suit on. It probably is plankton or some sort of beastie like that. The fact you swell up and itch the next day, is probably due to sensitive skin. To get around this, if you think you have been "gotten" after a dive, then go for an antihistamine like Clarityn, and take one a day. This should stop the swelling up and itching. Hi, Every time I go diving I seem to get bites on my toes. First time it happened was after diving at Swanage Pier and there were bites all over the underside of my toes and on the balls of my feet that were so painful I could hardly walk. They are individual red spots that swell up and itch too, so I can only assume they are bites. However, every time I go diving now I get the same thing, but fewer of them (usually a few bites on each little toe now). It's really quite frustrating as I don't know what it is. I have tried disinfecting my boots, but even after that I still got a couple more on one toe. What do you think it could be and what else can I do to prevent it? Sea lice or other such scummy critters. New boots. At £15.99, the disinfectant will probably cost you more. From your story things are improving, if you are now down to two bites as opposed to a foot full. I would just buy some new boots and if it did ever happen only at Swanage again then we can point a finger of blame. Allergy, infection or infestation. A forensic water sample could be run and show the people there excrete only ammonia in their urine. That’ll be the inbreeding down there then.